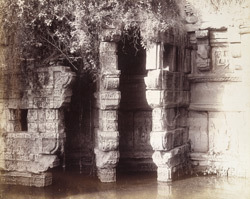 Photograph of the carved brackets of the Rani Wav or Queen's Well at Patan in Gujarat, taken by Henry Cousens in the 1880s, from the Archaeological Survey of India Collections. The city of Patan was formerly called Anhilvada or Anhilpur and was established in 765 by Vanaraja, the first king of the Chavada dynasty. The Queen's Well was built in the late 11th century to the north-west of Patan, by Udaymati, the wife of Raja Bhima. It is one of the finest step-wells of Gujarat. Multi-storey colonnades connect a stepped tank with a circular well; columns, brackets and wall panels are embellished with ornate carving. Only fragments of the well remains.